For other uses, see Altai (disambiguation). The Altai Republic (/ˈæltaɪ/; Russian: Респу́блика Алта́й, translit. Respúblika Altáj, pronounced [rʲɪˈspublʲɪkə ɐlˈtaj]; Altai: Алтай Республика, Altay Respublika) is a federal subject (a republic) of Russia. It is geographically located in the West Siberia region of Asian Russia, and is part of the Siberian Federal District. 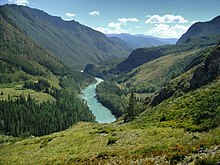 The Altai Republic covers an area of 92,600 square kilometers (35,800 sq mi) and has a population of 206,168 (2010 Census), the least-populous republic of Russia and federal subject in Siberia. Gorno-Altaysk is the capital and the largest town of the Altai Republic. The Altai Republic is one of Russia's ethnic republics, primarily representing the indigenous Altay people, a Turkic ethnic group that form 35% of the Republic's population, while ethnic Russians form a majority at 57%, and with minority populations of Kazakhs, other Central Asian ethnicities, and Germans. The official languages of the Altai Republic are Russian and the Altay language. The southern part of the Altai Republic came under the Naiman Khanate. The territory of the modern Altai Republic has been ruled by the Mongolic Xianbei state (93-234), Rouran Khaganate (330-555), Mongol Empire (1206-1368), Golden Horde (1240-1502), Zunghar Khanate (1634-1758) and Qing Empire (1757-1864). Since the annexation of the entire Altan Nuur Uriankhai into Russia in 1864-1867, the Altaians no longer enjoyed autonomy until June 1, 1922, with the creation of Oyrot Autonomous Oblast (Ойро́тская автоно́мная о́бласть), part of Altai Krai. During the Russian Civil War, the Confederated Republic of Altai was established, and declared as the first step to rebuilding Genghis Khan's Mongol Empire. But it never became a competing force in the Russian Civil War, and stayed neutral from 1917 until January 1920, when it was annexed back into Russia. The original name for this region was Bazla. On January 7, 1948, it was renamed Gorno-Altai Autonomous Oblast (Го́рно-Алта́йская автоно́мная о́бласть). In 1991 it was reorganized into the Gorno-Altai Autonomous Soviet Socialist Republic (ASSR). In 1992 it was renamed as the Altai Republic. The Altai Republic is situated in the Altai Mountains in the very center of Asia at the junction of the Siberian taiga, the steppes of Kazakhstan and the semi-deserts of Mongolia. Forests cover about 25% of the republic's territory. Katun River in the Altai Republic. The source of the black Biya River is Lake Teletskoye, the region's largest lake located in an isolated area far south in the mountains. The emerald-colored Katun River has its source at the Gebler glacier, which is situated on the Republic's highest point, Mount Belukha. The Katun River, in particular, holds a religious significance for native Altaians, as well as for many Russians who live in the area, as Mount Belukha is known in Altai folklore to be the gateway to the mystical kingdom of Shambhala. The hydrographic network of the Republic also includes approximately 7,000 lakes, adding up to a total area of more than 700 km2 (270 sq mi). The largest lake is Lake Teletskoye, which is 80 km (50 mi) long and 5 kilometers (3.1 mi) wide, has an area of 230.8 square kilometers (89.1 sq mi), and has a maximum depth of 325 meters (1,066 ft). The mountain lakes of Altai contain enormous freshwater reserves of a very pure quality as a result of their distance from civilization. Lake Teletskoye alone contains more than 40 cubic kilometers (9.6 cu mi) of very clear water. Potential groundwater storage is evaluated at 22 million m³ per day, while the present use constitutes about 44,000 m³ per day. Various bodies of water are among the most important natural resources of the Republic. Mineral and hot springs are popular destinations for tourists and locals, sought for their therapeutic effects. Additionally, Altai glaciers contain a great amount of fresh water. The general volume of ice for registered Altai glaciers comes to a total of 57 km³, 52 km³ of which is water. The total water stock of the glaciers exceeds the average annual effluence of all Altai rivers, which are equal to 43 km³ per year. The largest glaciers are Bolshoy Taldurinsky (35 km²), Mensu (21 km²), Sofiysky (17 km²), and Bolshoy Maashey (16 km²). Map of the Altai Republic. The head of government in the Altai Republic is the Head of the Republic, popularly elected for a four-year term. As of 2006[update], the Head of the Republic is Alexander Vasilyevich Berdnikov, who succeeded Mikhail Lapshin in this post. The supreme legislative body of the republic is the State Assembly—El Kurultai, with 41 deputies popularly elected every four years. Igor Yaimov is the current Chairman of the State Assembly-El Kurultai from January 2002. The Altai Republic is a highly agricultural region. However, it does have some industry which includes foodstuffs, non-ferrous metallurgy, chemicals, gold mining, footwear, dairying, and timber. Tourism has also begun to make its mark on the economy, and a large number of new hotels and resorts catering towards "New Russians" have begun to appear. The Altai Republic is one of the few Russian political divisions without rail access. The main paved road is the Chuysky Tract, which spans the republic from the capital Gorno-Altaisk in the north to the Mongolian border in the south. The republic’s main paved road threads its way through the rugged Altai Mountains. A system of taxis and buses transports people between settlements. Within the settlements, people generally walk or ride horses. Helicopters are used for emergency transportation, to supply remote government outposts, and by wealthy tourists. In 2012, runway capacity at the Gorno-Altaysk Airport near the republic’s capital, was doubled. In June that same year, S7 Airlines started direct flights from Moscow. Prior to this, passengers used to fly through Barnaul in Altai Krai or Novosibirsk. A Voice of America reporter tours the Altai region in 2012. Different religions are present in Altay. According to a 2012 survey, 27.6% of the population adheres to the Russian Orthodox Church. The second most popular religions are ethnic and nature religions, namely Rodnovery (Slavic native faith), Tengrism (Central Asians' native faith) and Burkhanism, constituting altogether 13% of the population. 6% of the population follows Islam, 2% Hinduism (including Slavic-Vedic, Krishnaite, and Tantric movements), 1% are Old Believers and 1% Protestants. 25% of the population is "spiritual but not religious", 14% is atheist and 7.4% follows other religions or did not answer the question. From 1904 until the 1930s, a new religious movement called Burkhanism (or Ak Jang, the "white faith") was popularized among native Altaians. The religion originated in Altai and emphasized the "white" aspect of shamanistic practice. Burkhanism remains an important component of Altai national consciousness and is currently being revived in several forms along with indigenous Altai culture in general. The indigenous Altai culture holds the lands of Altai to be sacred. The indigenous (Turkic) languages are focused on the stewardship of the lands. The Altai oral history is transmitted by throat-singers. The Altai culture was repressed during Soviet times and has been rebounding since then. The clans of all ten regions gather in the village of Yelo for a biennial cultural celebration. There is also a large contingent of "Old Believers" who fled to Altai when they split from the Russian Orthodox Church over 300 years ago. They were taken in by the Altai people, and are now integrated into the fabric of Altai culture. In 2013, the Altai Republic participated in the Turkvision Song Contest. The Altai Republic's entry was the song "Altayym Menin" performed by Artur Marlujokov. The Altai Republic won the fifth place in the contest. Viktor Shvaiko (b. 1965), painter. ^ БГД. Gks.ru. Retrieved on 2013-08-20. 7 июня 1997 г. «Конституция Республики Алтай (Основной Закон)», в ред. Конституционного закона №5-КРЗ от 27 ноября 2007 г. (June 7, 1997 Constitution of the Altai Republic (Basic Law), as amended by the Constitutional Law #5-KRZ of November 27, 2007. ). Wikimedia Commons has media related to Altai Republic. Wikivoyage has a travel guide for Altai_Republic.